Welcome to FlackCheck.org’s Detecting Patterns of Deception, the beta version of a new page designed to help viewers spot and debunk slippery moves in politics. Watch videos on the Climate Change Debate, the Sequester Debate, the Affordable Care Act Debate, the Gun Debate and the Immigration Debate to see patterns of deception in contemporary debates. On the page, we parse misleading political communication into six main categories. Misunderstanding the Process identifies ways in which misleading assumptions about the nature and extent of executive or legislative power drive problematic promises, attacks and self-congratulatory communication. So, for example, the complexity of the legislative process makes it possible for bills and votes to be misconstrued. Misleading Use Of Language features ways in which politicians exploit the ambiguities and connotations in words to prompt unjustified conclusions. Misleading Audio/Visual Cuing illustrates how pictures and sound can be manipulated to elicit false inferences. Misleading By Not Telling The Whole Story focuses attention on the process by which political sins of omission, including selective uses of evidence, deceive. False Logic covers common errors in argument that lead audiences to faulty conclusions. Hypocritical Attack examines statements that apply a different standard to one candidate than to another or imply a difference between candidates where none in fact exists. The Detecting Patterns of Deception page labels, defines and illustrates 32 suspect communication strategies. Where applicable, we have included FlackCheck.org’s takedowns of specific messages embodying the identified moves, as well. To learn more about our goals for the Detecting Patterns of Deception page, please read Recognizing and Rejecting Patterns of Deception. 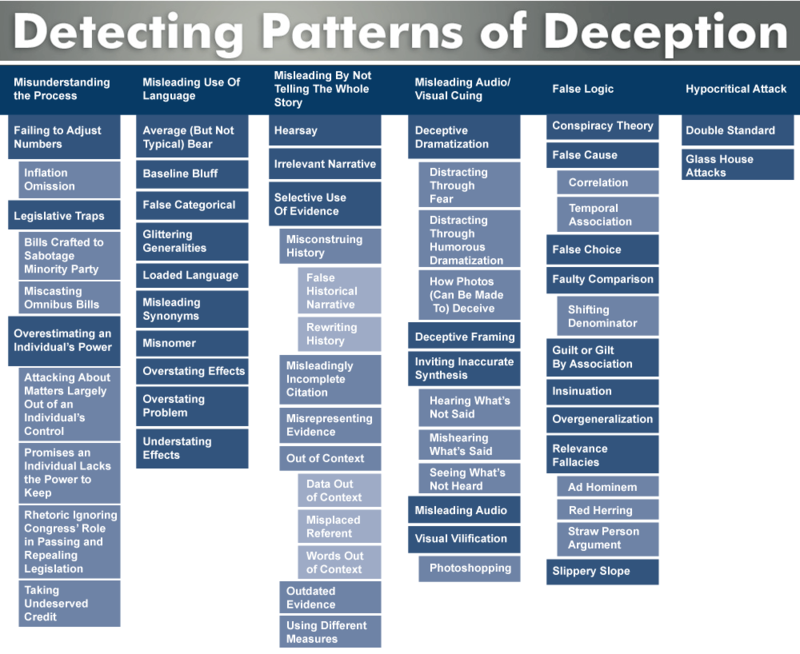 Click here to see an overview of the Patterns of Deception categories. To send us feedback on the site, including suggested new categories or examples, or to recommend ways to improve the site, click here.